The different wood twin beds such as; oak, pine and many others give you a choice to select the right bed for your room decoration and style. Normally the wooden beds are heavy and can’t be moved easily from room to room while these have been popular and are being used widely. Manufactured from selected solids and veneers, the Alisdair Sleigh Bed is sturdy in construction and appealing to the eyes. Stylish and elegant design of this Alisdair Sleigh Bed will add a touch of class with sophistication to your cozy bedroom décor. Headboard, footboard, base and side rails included. 3 slats for mattress support. Box spring required (not included). Maximum weight capacity: 450 lbs. Available in various sizes (king size, queen size, twin size and full size). Quality assembly in United States from global components. Maximum weight limit is 450 lbs. Enhance your bedroom’s aesthetic appeal with chic and modish Lottie Platform Bed. The sturdy platform bed is manufactured from Tropical Mahogany wood and birch wood veneers that ensure endurance and durability. This bed features stunning espresso finish and rectangular headboard with square cutout details that blends gracefully into any contemporary bedroom setting. 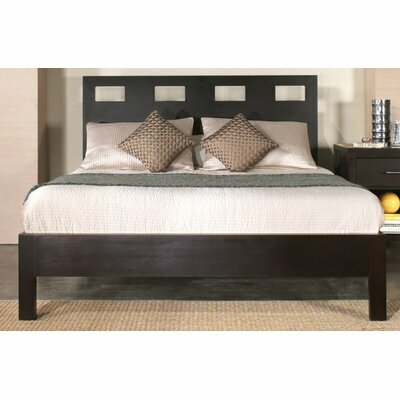 14 solid wood slats and center support legs provide additional stability and endurance to the bed frame. Manufactured from Tropical Mahogany wood and Birch wood veneers. Wooden bed frame with veneer headboard. Headboard and side rails included. Adjustable bed rails that can be flipped easily to match mattress height. 14 solid wood slats can be used with or without box spring. Available in various sizes (California king size, king size, queen size, twin size and full size). Style and functionality blends beautifully in this Arrowwood Panel Bed. The gorgeous Arrowwood Panel Bed features a bookcase headboard for keeping books, newspapers, magazines, CDs or decoration pieces. Constructed from good quality wood with simplistic yet elegant design and appealing cappuccino finish, this bed is sure to grab everyone’s attention. Solid wood and veneer construction. Headboard, footboard, and side rails included. Headboard features an elegant and spacious bookcase. Slat system included for support. Available in multiple sizes (California king size, queen size, twin size and full size). 6 months product warranty against any defect. Greyson Storage Platform Bed will add a cozy charm to your bedroom with its simple yet classy design that features two splendid under-bed storage drawers where you can put bed sheets, pillow covers, blankets or even toys of your kids. 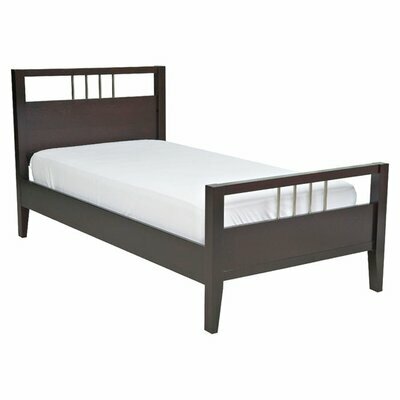 Solid wood construction with 14 slats makes this bed sturdy, stable and durable. Available in various sizes and finishes such as Antique Walnut, Caramel Latte, Espresso and White finish, this Contemporary style bed will match any bedroom décor scheme. Greyson Storage Platform Bed collection. 2 massive under-bed storage drawers can be placed on either side of bed. 14 slats included to provide support to the mattress. Available in different sizes (queen size, twin size and full size). Other •	Bottom of Side Rail to Floor: 11.5"
Contemporary and chic style of the LifeStyle Solutions Soho Platform Bed will add an appealing charm to your bedroom décor. Manufactured from premium quality wood, this platform bed features 13 slats and bed rails to ensure maximum support and stability to the mattress for many years to come. The attractive Soho Platform Bed by LifeStyle Solutions requires minor assembly and is available in various sizes and different finishes to perfectly compliment wide range of bedroom settings. 13 slats included for support and durability. Available in various sizes (king size, queen size and full size). Maximum weight limit: 400 lbs. Sturdy and robust Alpine Furniture Manhattan Platform Bed will accentuate the look of your bedroom interior with its finest quality wood and appealing and artistic box shaped cutouts on the headboard. The rich and elegant dark espresso finish will enhance the warmth and coziness of your bedroom. Selected solids and veneer construction. 10 slats to support mattress. 2 center support legs ensure extra stability. Box spring is not required. Maximum weight capacity is 400 lbs. Available in twin size and California king size. Improve the ambiance of your bedroom with a feel of classic elegance of this stunningly gorgeous Rustic Natural Cedar Furniture Rustic Slat Bed. The Rustic Slat Bed is manufactured from Northern White Cedar wood that features a sturdy and solid wood construction that can endure the wear and tear of many years. 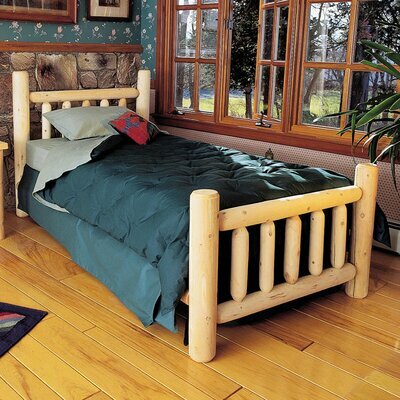 Nature-inspired colored slatted headboard and footboard with thick round wooden logs makes this unique and stylish bed a must have. Bed frame constructed from Northern White Cedar. Headboard, footboard and side rails included. Available in various sizes (king size, queen size, twin size and double size). Maximum weight capacity: 1200 lbs. 5 years product warranty against any defects. Curved headboard and footboard with thick bracket legs adds a hint of formal traditional to this Contemporary style Caldello Sleigh Bed. 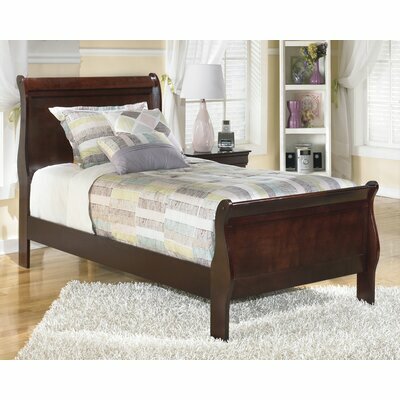 This bed features solid wood construction with beautiful brown finish that blends dexterously with any bedroom interior. 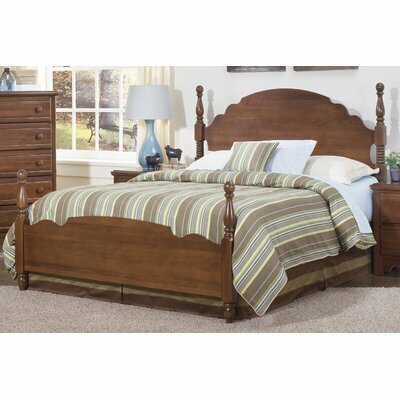 This classy sleigh bed is available in king size California king size, queen size, twin size and full size. Manufactured from Selected hardwood solids and veneers. Headboard with matching footboard and side rails included. Box spring is required (not included). Available in several sizes (king size, queen size, twin size and full size). The Alan Twin Platform Bed creates an elegant and decent focal point in your bedroom with its six-step American Espresso finish headboard, footboard and side rails. This slat bed features sturdy wood construction with wooden slats, center support legs and rails to add maximum strength and longevity. The Alan Twin Platform Bed is available in multiple sizes and it is a perfect choice with space-efficiency. Alan Twin Platform Bed collection. Elegant and attractive Six-step American Espresso finish. 14 slats with center support legs provide additional stability with endurance. Available in various sizes (king size, California king size, queen size, twin size and full size). Maximum weight capacity is 800 lbs. 1 year warranty against any defect. Crossroads Four Poster Bed by Carolina Furniture Works, Inc. enhances the appeal of your bedroom décor with its traditional style bed frame. This bed features attractive shaker design and soft rounded elements that produce a pleasing visual experience with simple wooden knobs. This bed is an incredible addition to a traditional home setting. Crossroads Four Poster Bed collection. Constructed from Natural oak wood. Available in king size, queen size, twin size and full size.